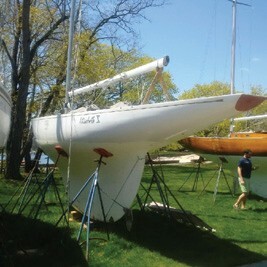 How many know that the venerable International One Design, the oldest one-design keelboat still racing, the queen of the Long Island Sound elite sailors beginning in the late 1930s when Larchmont Yacht Club’s Cornelius Shields commissioned the first order, was in fact a one-design Six Metre? A Norwegian boat builder named Bjarne Aas is credited as the designer, and he built them out of oak and cedar beginning in 1936. I learned that at the 75th Anniversary of the IOD in Marblehead in 2011. We have been sailing IODs since 1999 in the fleet of 15 all-fiberglass IODs built near Boston and owned by the Nantucket Island IOD Racing Association. A group of almost 100 sailors organized into syndicates sail identical white IODs with green boot-top and copper bottoms from the Fourth of July to Labor Day. With red and white striped spinnakers, they make for a stunning sight in the prevailing brisk sea breezes of midsummer. This year, the Nantucket fleet is hosting the IOD Worlds for the second time, the first being in 2007. Back in Western Long Island Sound where the IOD was born, we sail the last remaining “woodie” among Long Island Sound IODs, #5, Topaz, skippered and owned by Jennifer Miller, a New York City investment manager. Jennifer took over the boat after years of being the foredeck crew when her father passed on. The original owner, John F. Dorsey, had Topaz built in Norway, cost unknown. To our knowledge she was one of the last woodies built, as the original plug for fiberglass IODs was built in 1970. Jennifer’s father, Robert Miller, crewed for Dorsey and inherited the boat when the owner moved on to a powerboat. From 1974 to 2001, Topaz was among the shrinking number of wooden IODs campaigned on the Sound. With new frames, a fiberglass bottom and a new high-capacity bilge pump, she remains a fast boat that Jennifer has campaigned hard since 2004. A group of Manhattan sailors work every spring to launch Topaz in May for the season that stretches from Memorial Day to Columbus Day. Last year, we were second in an uncharacteristically breezy Larchmont Race Week. We qualified second for the season, and will represent Long Island Sound in the 2015 North Americans, which will be hosted by Larchmont YC September 18-20. 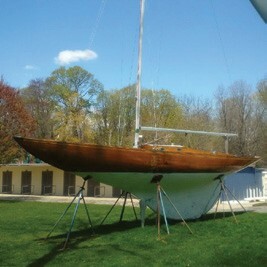 When we arrived this year on a warm April day to start our three weekends of sanding, filling, varnishing and painting, we were surprised to find a neighbor, a similarly sized, all white, modern-rigged alter ego, a real vintage 6 Metre named Elizabeth X. This “modern” 6 Metre featured a full aluminum-sparred masthead rig with running backstays, a long graceful bow but a very similar pinched teeny transom too small to carry the name. On the side midships reads “Helsinki 1952-2011” with the Olympic rings. Elizabeth X has the traditional two-cockpit design, the skipper in the aft cockpit with the mainsheet winches separating his footwell from the main raised-floor cockpit for the genoa and spinnaker trimmers. No toerails must make the foredeck crew’s job a formidable one. 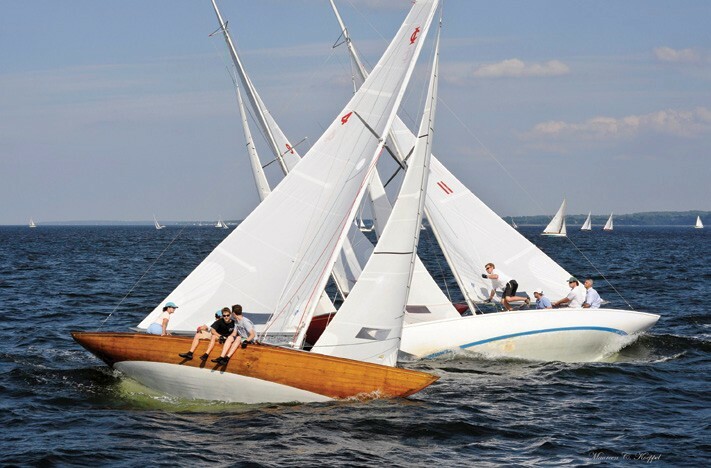 After the Helsinski 1952 Games, she was bought by 6 Metre enthusiast Bryan Newkirk of the Royal Canadian Yacht Club in Toronto, where the Six Metre and the Eight Metre have long been a passion. Anyone viewing the model room of the RCYC can see a long progression of these two Metre designs going back into the 19th century. A search of the 6 Metre class files listed the boat as Norway 80, formerly owned under the name Bibis – named after Newkirk’s granddaughter and sailed in Toronto from 1952 to the mid 1990s, after which her location was lost. Lake Ontario was a hotbed of Metre boat sailing in the 1950s, with a fleet of over 20 6s and 8s competing among five local yacht clubs. We see the 8 Meter Quest, a 1913 Fife design, come down to Nantucket every year and compete in the Opera House Cup for classic wooden yachts. On the RCYC website, the story of Elizabeth X is continued by Hans Oen, a Larchmont Yacht Club sailor who purchased the boat from Norway in 1999 and restored her with his local boat partner, Peter Hoffman, also of Larchmont. Designed and built by Bjarne Aas in 1947, she was christened as sail #N 80. Commissioned by a Royal Norweigan YC syndicate in 1947 and owned originally under the name Cutter, Elizabeth X was sailed by a famous Finn skipper, Christian Ferner, for Norway in two Scandanavian Gold Cups in 1951 and ‘52. Sailing for Norway, she was edged out in the last race of the 1952 Helsinki Olympics by the US Llaronoria, helmed by perpetual Olympic 6 Metre skipper Herman Whiton. This was the last Olympics for the 6 Metre, as the 5.5 Metre was introduced for that event, with Britton Chance winning the Gold in 1952. The rest of this story is told in the pictures, the bows, the sterns, the rigs, the overall grace of the two boats, even out of the water. The IOD was designed in 1936 from an S&S design, Ghost, admired by Corny Shields. 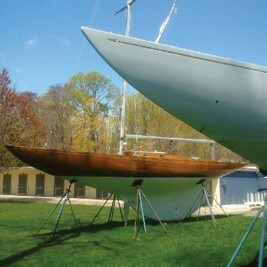 Her 1947 constructed descendent, portrayed in green topsides and red bottom in the RCYC website photo as Bibis, has been on the water almost 20 years longer than the 1966-built Topaz. The solid white Elizabeth X will be out on Long Island Sound again this summer. In early May, when we went out to rig Topaz, there was Hans Oen chugging out under the power of a vintage British Seagull one-lunger outboard strapped to a bracket on the port side, headed for a new berth for a classic beauty. She’s 68 years young, as Topaz heads for her Jubilee next year in 2016. Tom Darling races IODs in the Western Long Island Sound and Nantucket fleets and crews on a classic wooden Alerion sloop in Nantucket Harbor. As a regular reader, and admirer of WindCheck, a former owner of Atlantic Class #91, and a former Secretary of the Atlantic Class, I feel I must advise you of errors in Tom Darling’s article [“A Tale of Two Sixes”; July, 2015]. The first paragraph describes the IOD as the oldest onedesign keelboat still racing, the queen of Long Island Sound elite racers beginning in the late 1930s. The Atlantic Class is 10 years older, was designed by Starling Burgess, and held its first nationals in 1929. Corny Shields himself was a national champion in the Atlantic in 1931, sailing out of Larchmont. The Atlantic Class list of national champions arguably makes the Atlantic the king of elite racers, with the likes of Bob Mosbacher, a two-time Atlantic champion, and Briggs Cunningham, a five-time champion. I’d like to refer you to “History of the Class” at the Atlantic Class website, atlanticclass.org, which includes a list of national champions. Thanks for looking into this. Ron – Thanks for the clarification. We are lucky to have such beautiful and enduring designs still actively sailing in our region. As much as I appreciate the beauty of the Atlantic and IOD classes, everyone seems to have forgotten the Star class. While not an offshore class, they do go back to 1911-12 and are, as far as I know still actively raced.